Remember that nifty looking retro word processor I found a couple months back? It went up for pre-order today in a Kickstarter campaign. If you have $400 to throw down and act fast, you too can get in line to receive a Hemingwrite when it ships in September 2015. I won't be bothering, but it is a groovy gadget. Based around a 6" E-ink screen, the Hemingwrite comes with Bluetooth, Wifi, a month-long battery life, storage for a million plus pages of text, and not much else. The Hemingwrite is built for a single purpose - to write - and to that end it also will also ship with support for syncing your work with your favorite cloud apps (Evernote and Google Docs integration will be supported, at a minimum). Weighing in at 4 pounds, it's about the size of an old, old notebook - only much lighter. It's chief feature is the 78-key keyboard, which is designed to offer a satisfying tactile and audio feedback when your fingers hit the keys. That strikes me as a great way to destroy a $400 gadget, but what do I know. I won't be getting a Hemingwrite, but I can see how it might be useful. I'd like to see someone explore the possibility of using this in conjunction with a smartphone for mobile blogging. 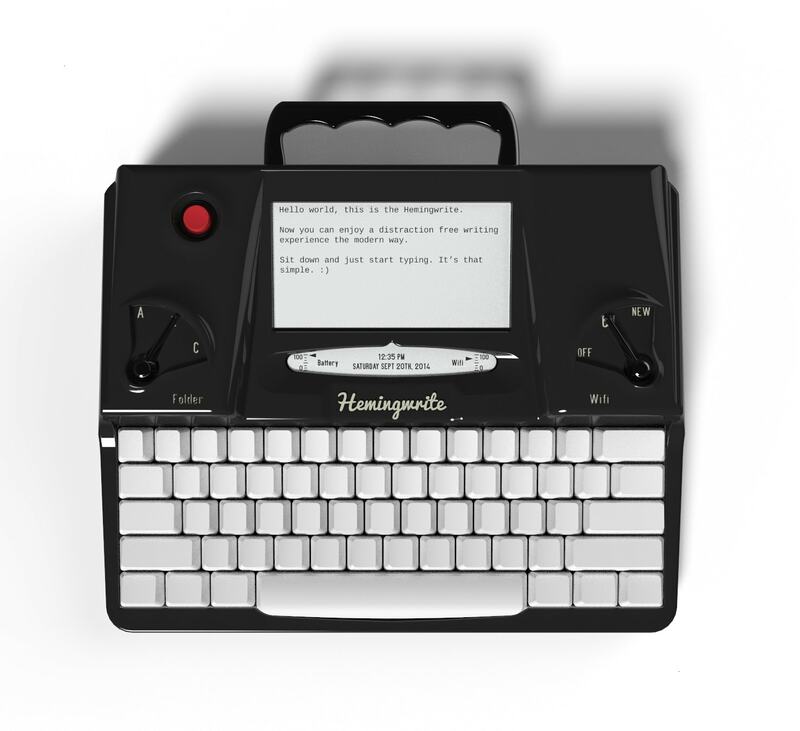 A blogger could bang out a story on the Hemingwrite, sync it with their smartphone, and then upload the text (along with photos taken with the smartphone) so a co-worker can polish the story and publish it. Okay, that doesn't sound nearly as useful as a laptop (on a BT keyboard paired with said smartphone), but I can see the appeal. But I still won't be getting one. At 4 pounds and $400, the Hemingwrite is going to compete with my next laptop for both the space in my gear bag and for the dollars in my pocket, and I don't have enough of either space or money to be able to get both a laptop and a Hemingwrite. It's shiny, yes, but I will have to admire it from afar. But for the sake of curiosity, I will be getting a poor man's Hemingwrite. 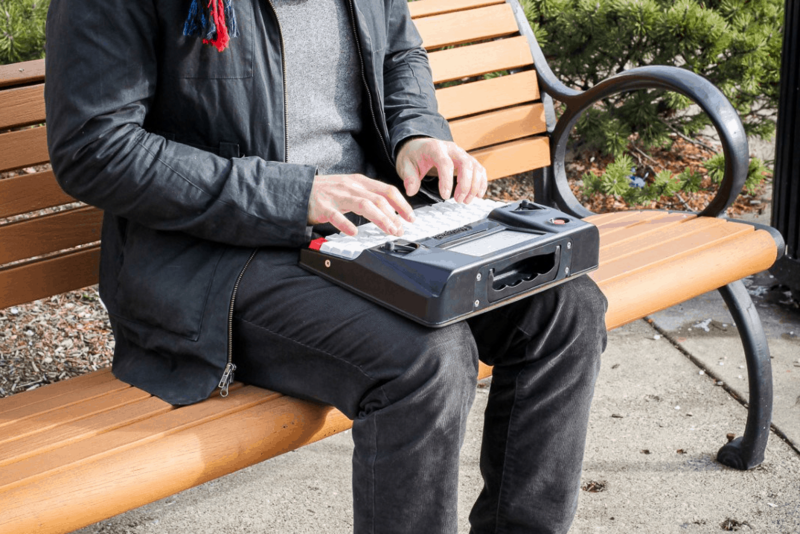 The Alphasmart Neo is an older, cheaper, keyboard-sized word processor which can do pretty much the same thing as the Hemingwrite (aside from the wireless connectivity). Powered by AA batteries, the Neo can be found for under $30 on Ebay. It's not nearly as cool-looking as the Hemingwrite, but the Neo is light enough that I could potentially carry it in the same gear bag as my laptop. That is woth a lot to me. But that's just me; what do you think of the Hemingwrite? Yeah, about $300 too much. For $99 bucks I might buy one to just play with it. And the retail will be over $500. Too expensive and not enough difference to the Neo. At that price you can buy a lot of great laptops or Chromebooks. Heck, you can by 2 decent Chromebooks for the KS price. Clearly meant for people with more money than sense. That being said, I have long wondered if the technology has advanced to the point where there can be a small market for unusual (kind of goofy) laptops. Ones that can do just enough to get by for a trip to the coffee shop, but aren’t really serious computers. This thing isn’t distinctive enough to justify the price. But I might pay $400 for a really cool looking steampunk laptop. Or a retro Jetson’s space age one. Kind of toys for adults (overaged geeks with money). All it would need to do pretty much is surf the web and handle emails and light word processing. Kind of like a Chromebook but with a really cool design. Very long battery life (epaper?) would also be a plus. I loved the look of the eMate 300 and desperately tried to find a use for it, but it just couldn’t do much. But these days you can get basic computer functions in sub $100 tablets so it seems like adding a keyboard and a fancy case would be easy. I was thinking the same thing. Like, an Apple bluetooth keyboard hot-wired to some Android e-ink tablet with all its wireless except bluetooth disabled, and an SD card. The Hemingwrite is at least $400 too expensive retail. At times like this I am reminded of the HP Jornada 720, one of the last of the HPCs. With a 6″ screen and a compressed keyboard, it was pocketable and immensely useful. Now that is something that needs to be brought back, only with a 6″ E-ink screen. It’s a pity no one has built one; I’d buy it. That would be the holy grail of devices to me. It’s hard for me to believe this is already almost 80 percent of the way to its funding goal. To me it’s really overpriced for something so limited. They had a good marketing campaign. I have an alphasmart neo and the keyboard is neat and the display is usable. It is also as hard as a brick. It offer the same as this stupid device… and, at the end, I don’t use it too much. Why? Because limitations. Limitations were understandable in 1998, but not now. I mean, if I write on the device and then I have to use a smartphone, then it’s better to use a good bluetooth keyboard with the smartphone, which is what I do. I carry always with me an astounding iGo stowaway, one of the few keyboards that don’t lose valor with the years. That thing has a soviet-like building quality. I think that, at least, a good ereader should have access to a browser in order to use certain web apps for writing. email would be useful too. I mean, distractions-free environment is more dependant of the user’s will rather than of hard restrictions. Just get (or pull out of drawer) a bluetooth keyboard and pair it with that Onyx e-ink reader running Android. Or get a real thing – a Model M IBM keyboard. And a small box that you can plug the keyboard to and that converts it to a bluetooth signal. Then you can use it for that Onyx reader AND your phone AND that set-top box for your TV and also for your computer. Ideally it would be built into the case for the ereader. But you’re right in that there are some BT keyboards about the right size. I would rather an e ink screen that I could stick on the front of my iPad. Kinda like these iPhone cases coming out, but this could sit in the back, be detached, and be placed at the front when needed. I always used to have issues with mechanical keyboards. I don’t want to go back to them. Word processing on e ink is great though. Since someone has figured out how to hack some readers to work with keyboards, might try and make my own version of this. I like the idea, having used this little baby for a decade. Im afraid that the ugly bulky look of the Hemmingwrite will be all I am thinking of then trying to do work of this thing. There was som devices a decade ago, that could do the job, before it all became social media. Yes, the Psion line was pretty nifty all around, and the last generation was actually the first netbook. I liked it; between Wince and the 7″ screen it was a fun gadget. I don’t think it had a great design, but that could be the result of it being 5 years ahead of its time. It’s as a dumb as a brick. A full-sized keyboard and stamp-sized screen? What’s it for? Writing tweets?